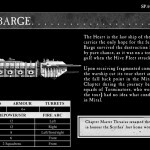 Arriving in the Miral System, only traces of wreckage from the rest of the fleet could be found, along with just a handful of battle brothers still alive on the surface of Miral Prime, holding a position on Giants Coffin under threat of being overrun. Diving into action, the battle barge caught the closely packed Tyranid fleet by surprise, and by using bombardment cannons punched a small window through to the surface of the planet. This one last chance was seized upon by the Scythes and with the aid of a furious counter attack from the ships Terminators, the battered remnants of the chapter were evacuated from the surface using Thunderhawks. Chapter Master Thorcyra remained on the surface and held a rearguard action that enabled the survivors to escape, passing command of the chapter to Captain Thrasius of the 3rd Company. The Scythes then withdrew from the Miral system, engaged in a running space battle against everything the five fleet could muster. When the chapter had fought clear, the first act of Chapter Master Thrasius was to rename the ship from ‘Honours Might’ to ‘The Heart of Sotha’, so that the chapter could honour their lost home world and the memory of the fallen. The future of the Chapter now rests within ‘The Heart’, and while the ship has taken the sort of damage and punishment that should have destroyed her many times over… she resolutely refuse to break and carries her scars with a stoicism that mirrors the Scythes themselves. Now the last of the Scythes Battle Barges patrols the Eastern Fringe, carrying the Chapter into battle against the enemies of the Imperium, acting as a recruitment and training vessel for Novitiates and helping produce what equipment and ordnance the Chapter needs. Slowly the Scythes have begun the painstaking process of rebuilding their strength, and while ‘The Heart’ still beats, the Chapter lives. Heart of Sotha, High Resolution for Download. A long time collector of the Scythes, Andrew is a hosted contributor to the site and writer/researcher behind the Scythes : A Factual History PDF. You can view his superb collection in the Heart of Sotha project.